Why are they called S'mores? Because once you have one you want some more! A dessert consisting usually of toasted marshmallow and pieces of chocolate bar sandwiched between two graham crackers. As I've said before I grew up in a camping family so S'mores were one of the earliest sweets I can remember. I loved mine where the marshmallow was toasted almost to the point of being black because it would melt the chocolate until it dripped off the graham cracker. There's nothing more fun than having to blow out the flames on your marshmallow then quickly sticking it on the waiting chocolate covered graham crackers and squishing the whole pile into a gooey mess. To this day it's the only way I will voluntarily eat a graham cracker and enjoy it. Being part of a good scouting family we were required to gather our own marshmallow toasting stick and whittle it to a point ourselves. 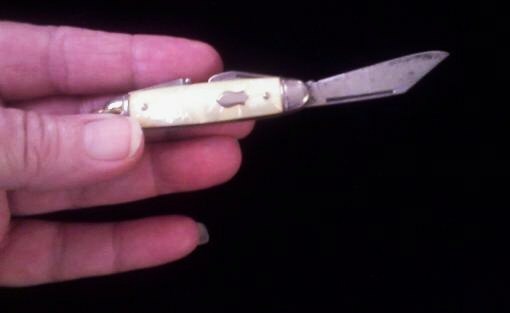 I still have the little knife my father gave me one camping trip when I was deemed old enough to do this myself. 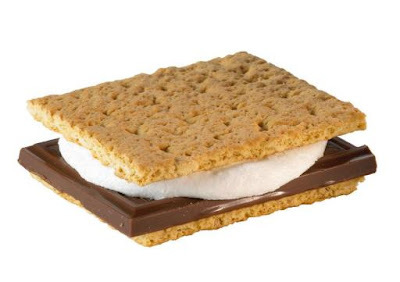 S'mores are such an iconic part of an American campfire experience that it's almost sacrilegious to be sitting next to a flaming wood fire and not pull out boxes of graham crackers, bags of marshmallows and bars of chocolate. Get 2 squares of graham crackers ready on a paper plate. Place enough Hershey's (yes, I said Hershey's - it's not a true pop culture food without Hershey's) chocolate to cover one of the graham cracker squares. Get a stick from a nearby tree and whittle one end to a point. Place a marshmallow on your stick and roast it to a golden brown color - the marshmallow should be melted enough to almost be falling off your stick! 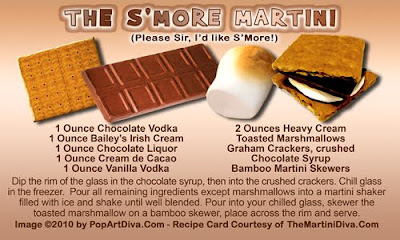 Quickly grab the marshmallow off the stick and plop it down on the chocolate. Put the second graham cracker over the marshmallow. Squish the whole gooey mess until the chocolate and marshmallow ooze out the sides and onto your fingers. Eat with childlike abandon and glee. You can, if without a campfire or open flame, microwave the marshmallow but it's not really a S'more without the charred marshmallow. The direct fire gives a crunchy caramelized addition to this campfire dessert that nothing else can reproduce. Ben & Jerry's has a S'mores ice cream flavor, there's a Pop Tart S'mores, there are S'mores flavored energy bars, Russell Stover has a S'mores candy bar, Weight Watchers has a diet S'mores treat and Epicurious has a S'mores Cheesecake recipe. Krispy Kreme even has a S'mores Doughnut! There are all sorts of ways to get the S'mores flavor in the 21st century but none of these can compare to the classic campfire treat above. “National S’mores Day” is on August 10th each year - this date was instituted by the Hershey Company. The Hershey Company makes more than 373 million HERSHEY’S Milk Chocolate bars a year. That’s enough to make 746 million S’mores! Chocolate Chip Cookie S'mores, Chocolate Banana S’mores, Peanut Butter & Jelly S’mores, Coconut S’mores, Rocky Road S’mores, Peanut Butter Cup S'mores. As promised - or threatened, whichever way you choose to look at it - here is my Pop Art Hot Dog with sides of potato chips, a dill pickle and a nice soft drink. 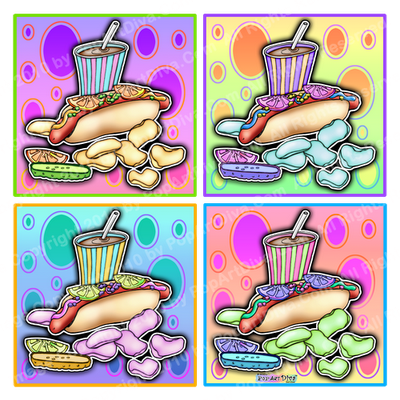 I wanted this to be a companion piece to my Pop Art Hamburger and Fries so I left the hot dog and the bun normal colors in all sections and played with the side orders colors. Nothing like a blue dill pickle to tickle your food humor! 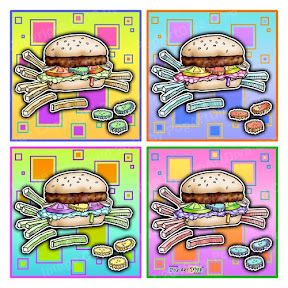 I also tied the background in - using ovals on this instead of the squares on the burger piece. I really think these backgrounds give the illustrations a very retro look. I realized what I have here is a Pop Art Chicago Dog thanks to the pickle and tomato! I'm a fan of chili dogs myself but I wanted a classic hot dog because pop art is a comment on pop culture and the classic frankfurter is part of our Americana. If you're from L.A. think of it as a Dodger Dog, lol. I have to be honest, I drew the bloody hot dog a few times. For some reason it's so simple that I struggled to keep it from being unrecognizable! I originally had a mustard bottle in the background but there was WAY too much yellow when combined with the chips and mustard so I switched it out and put in a soft drink, then added a nice slice of dill pickle! Gotta have my dill pickle! Hot dogs always make me think of campfires at Boy Scout Jamborees. My dad was an executive with the Boy Scouts of America and we did a lot of cook outs - I mean a lot! The whole family was in scouting (Den Mother Mom, Eagle Scout Brother, Girl Scout Sister) and I spent a lot of my summers as a kid hanging out with Boy Scouts of all ages. I can still recite the Boy Scout Oath, "I will do my best, to do my duty, to God and my country and to obey the Scout law to help other people at all times. To keep myself physically strong, mentally awake and morally straight." Amazing considering I sometimes forget what day it is now. . . I will tell you that a hot dog on a stick over a nice wood fire tastes like nothing else on this earth - maybe I should have stuck in a small serving of S'mores on my Hot Dog Pop Art? It's a nice mate for my Pop Art Burger and Fries, don't you think? Both are available for licensing as well - all of my images are. Images Copyright 2010 by PopArtDiva.Com. All Rights Reserved. Remember Ked's Shoes? We used to call them "tennies" - they were lace up canvas shoes with a rubber soul and I must have had dozens of pairs of them in the fifties and early sixties. My brother used to have the hi-tops as well - they were introduced as Pro-Keds in the sixties and were marketed as basketball shoes. In fact, they were worn by many popular basketball players of the day. Keds were "scientifically designed" according to Colonel Keds - remember him from this commercial? I remember picking at the blue rubber label that was glued to the back of the upper soul until I peeled it off. I did it with every pair of Ked's shoes that I owned. I'd save that blue rubber label too, until I stuck it somewhere and forgot it. Did you know that these style shoes were called sneakers because the rubber soles allowed you to be silent when walking - thus you could "sneak" up on someone? I loved those shoes as a kid, I'd wear mine until they got holes in them from wear and tear and washing. Mom used to clean them in our washing machine - I think that's why she liked them, they were easy to keep clean as well as fairly inexpensive. When you had 3 children outgrowing shoes faster than a speeding bullet access to cheap, washable shoes was a boon to the family budget. I hadn't seen those shoes in years - they got pushed aside by Nikes, Reeboks and then by all the designer athletic shoes with all the bells and whistles of today's sports shoes. Simple little canvas tennies were out of style until retro fashions brought them back. I even saw them worn by Bella Swan of the Twilight films! 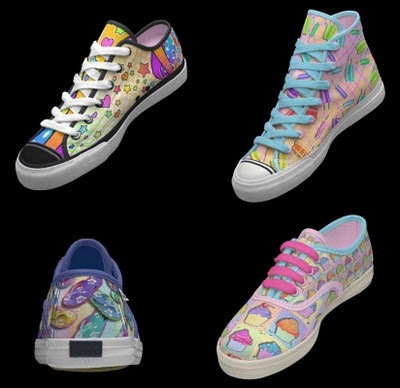 Now, thanks to modern technology, I get to put my own pop art designs on those same Keds shoes and I can change the colors of all the laces, trim & rubber souls to match my art as well. It's a real thrill seeing my art on something I loved as a kid. . . and the first thing I did when I got my first pair of my Pop Art Keds shoes was look for the little blue rubber label on the back of the heel - still there but I think I'll restrain myself from trying to peel them off . . . maybe. Ain't technology grand when it brings back something so cool from the past? Image Copyright 2010 by PopArtDiva.com. No permission is given to post, share, copy, print, e-mail, distribute or link to. All Rights Reserved. This is my latest in my pop art food series. I did "MARTINI ME" (see below) for The Martini Diva Boutique and really liked how the martini and the olives turned out and thought it would make a great traditional style pop art for The PopArtDiva Gift Gallery as well. 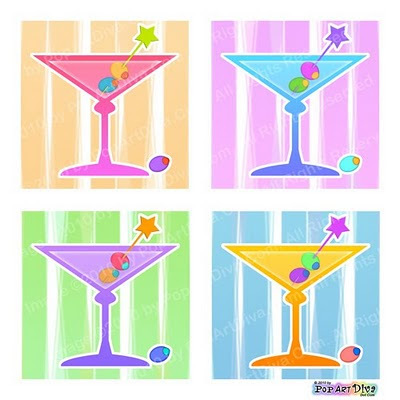 I love the playful look of the martini glass and the multi-colored olives but it was the background that really gives this Pop Art a retro look. For some reason the shades of the pastels and the stripes remind me of the Rat Pack - think Frank Sinatra and Dean Martin hanging out in Palm Springs. I also did Pop Art Margaritas, Pop Art Wine and Pop Art Cocktails for a series of four. I try to work in series for several reasons, it's a good idea if you're creating illustrations for product licensing and merchandise and it's also good for home decor as people often want a grouping for wall art. As always I do my images in several different shapes as well - usually a version in a standard print/poster size (18x24 or 16x20), a square version and a long horizontal rectangular version (great shape for over beds and sofas and as a cup wrap around). I also keep my "working" files - an unflattened version with all the layers still workable. I have often received licensing requests where a client will ask for one of my pieces but with different colors, different text or a different layout for a specific purpose. Think of any of these as cocktail napkins, coasters or paper plates or even as wrapping paper or fabric designs! I myself use my designs on several products like t-shirts and aprons, cups with a wrap around graphic, shoes, ties and even skateboards. All of these require different layouts of the illustration. Keeping my working files allows me to adjust almost any part of the illustration which is a real time saver! 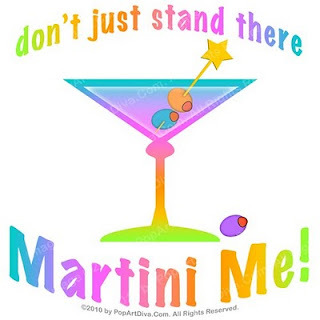 When I finished it I realized it would be a good idea to post the martini image without the text as well and then I saw the possibility of the martini glass as a new Pop Art Martini! All of the above images are available on posters, t-shirts, cards, shoes, hats, totes, aprons and even business card designs, postage and skateboards at my stores - all of them customizable too. Just click on any of the images or links to check them out! Interested in licensing one of my images?